During 2018, in the centenary of (some) women getting the vote, Running Past celebrated the militant Lewisham branch of the Women’s Social and Political Union. The name of Olive Llewhellin was mentioned in several posts, including a section within a post on activities in Lee and Hither Green. Her significance though was a little understated, largely due to an error in court and newspaper reporting where she was incorrectly referred to as Margaret. This post corrects this and tells Olive’s story. Olive was one of many suffragettes who refused to register in the 1911 census; she was living at 114 Burnt Ash Hill – where the only occupants listed were her mother Sarah Jane and her sister Daisy. Olive’s activity was a mixture of militancy and organisation. She was arrested at least three times– the first time was with fellow Lewisham branch member Clara Lambert in late January 1913 after the smashing of the windows of the Hamburg American Line in Cockspur Street off Trafalgar Square. While Olive was remanded in custody, unlike Clara, she was later discharged (1). One of her arrests may well be pictured below; it is a picture in her adopted family’s collection, they believe it to be Olive. She was arrested in Downing Street in the spring of 1913 for smashing the window of the Chief Whip at number 12 (2). In all the press reports, she was listed as ‘Margaret.’ Later editions of ‘The Suffragette’ corrected the mistake reporting the date that she was due to be released from Holloway in late April 1913 (3). Olive is listed in the roll of imprisoned suffragettes. The severity of Olive’s sentence was raised by Keir Hardie in the House of Commons in relation to the proportionality of the fine and whether there was an instruction to treat suffragettes differently to male defendants convicted of similar ‘crimes’. Olive was still incorrectly referred to as ‘Margaret.’ He pointed out that a Mr E W Hills who smashed windows valued at 2s 6d (12½p) at the WSPU Offices at Lincoln’s Inn House, was fined 5s (25p) or 7 days imprisonment. Olive was fined £2, had £2 2s costs awarded against her, and had to pay for the window, also valued at 2s 6d, a total of £4 4s 6d – over 33 times the total penalty of the male defendant. 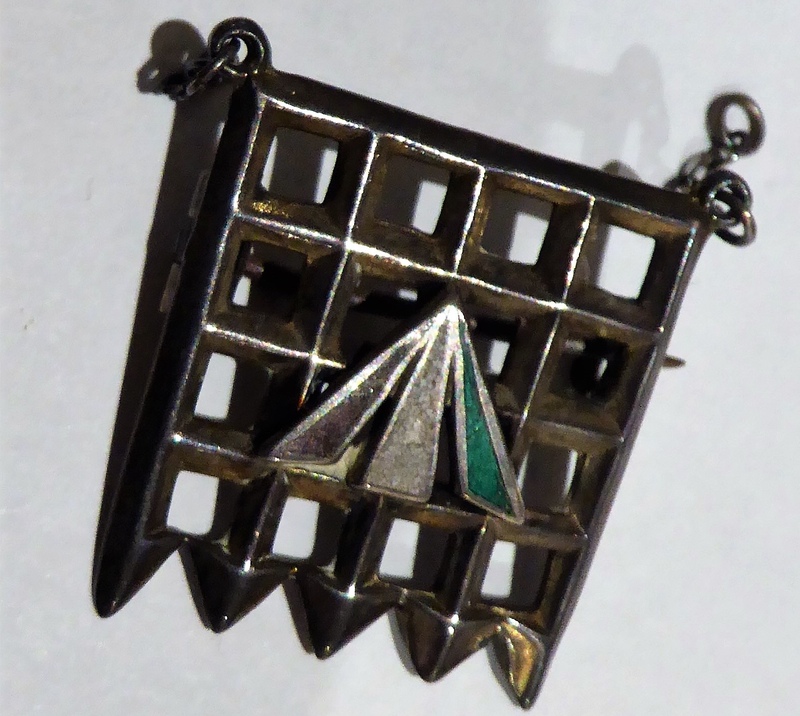 If there was any doubt as to her time in Holloway, her ‘adopted’ family still have the lovely portcullis brooch given to imprisoned suffragettes. 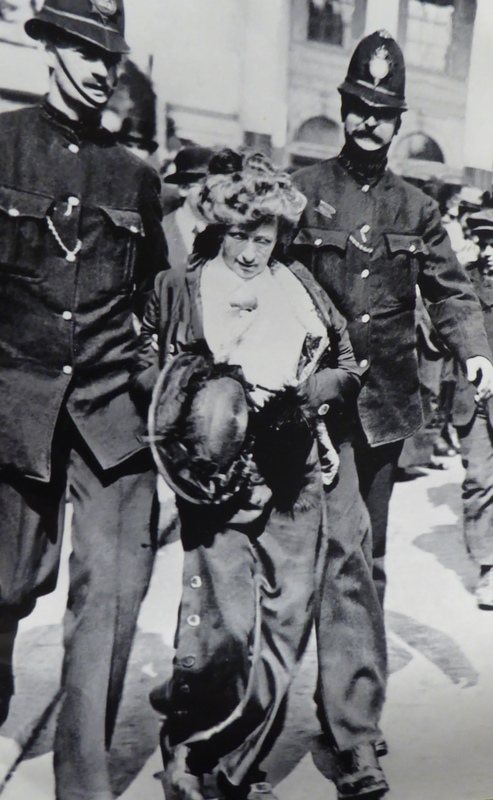 Olive was also arrested as part of protest by the Cymric Suffrage Union, which she was also a member of, due to her Welsh ancestry, when Lloyd George refused to see a deputation later in 1913 (4). 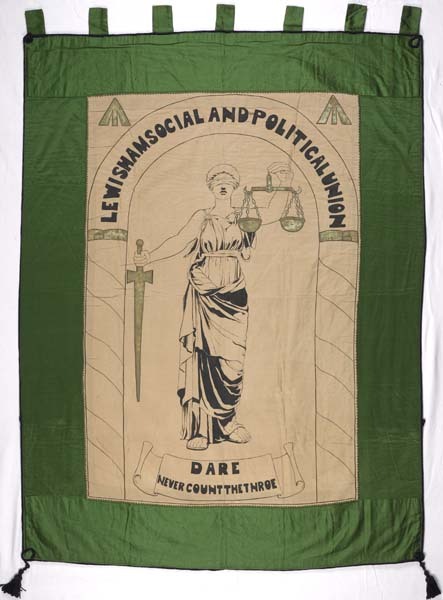 Olive was the driving force behind the Lewisham WSPU banner, above, (5) – she had designed a well-received poster for the office window in 1912 (6). This seems to have led to her designing the banner (7) and being in charge of the fundraising for it (8). She is pictured bottom right below, with Caroline Townsend to her left; above her to the left is Clara Lambert and a Miss Warwick to the right (9). Olive was Branch Treasurer from early 1913 (10) and briefly acted as Branch Secretary in mid-1913 (11). She was an occasional speaker at the public meetings held most Sunday evenings at 7:00 in Lewisham Market – such as on Sunday 21 September when she spoke with Eugenia Bouvier (12). Olive had been born on 8 October 1888, in Lewisham, and lived at 114 Burnt Ash Hill (a house probably built by John Pound) from around 1899 – her father appeared on the electoral register there from that year. 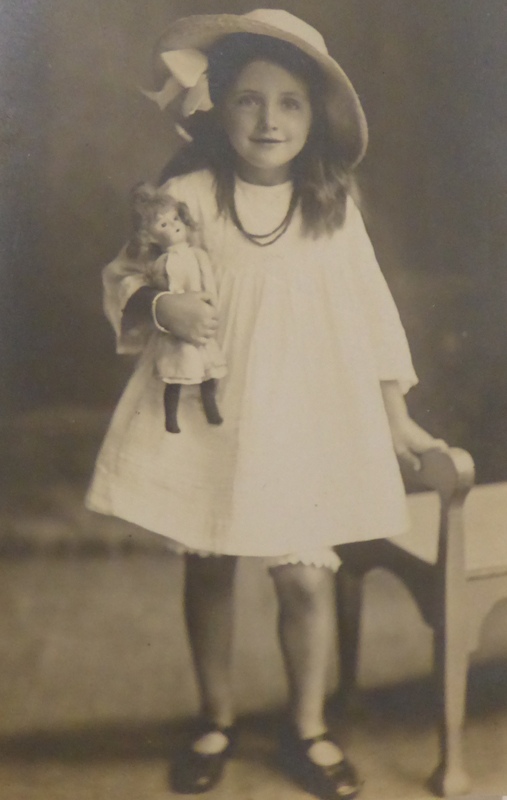 She is pictured below aged 7. Her parents were Arthur Jones Llewhellin, the mother was Sarah Jane (nee Thomas) – both were from Pembroke Dock in south west Wales, where they married in 1873. Arthur worked for the Inland Revenue and the family moved around a lot with children being born in Dublin, the Potteries, Malvern, Greenwich and Lewisham (Olive). 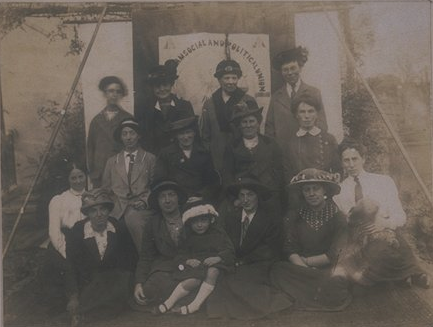 In terms of the local WSPU branch, both Sarah, Olive and her elder sister Ethel were active members – they were included in the branch photograph probably taken in mid-1913 at 3 Ravensbourne Park. Sarah is second from the left on the back row, Ethel is on the front row with her niece on her lap, and Olive is to the right of her (13). 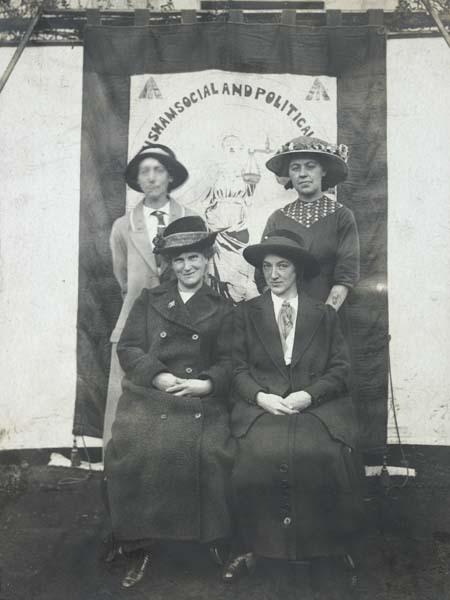 There is detail on the rest of group in the post on the Lewisham WSPU Branch. Sarah was widowed in 1906 and listed as living on her own means in the 1911 census; times obviously became harder for the family after Arthur died in early 1911. 114 was the first house in that part of Burnt Ash Hill to be split between two households – all the others had gone the same way be the time the 1920 Electoral Register was complied though. 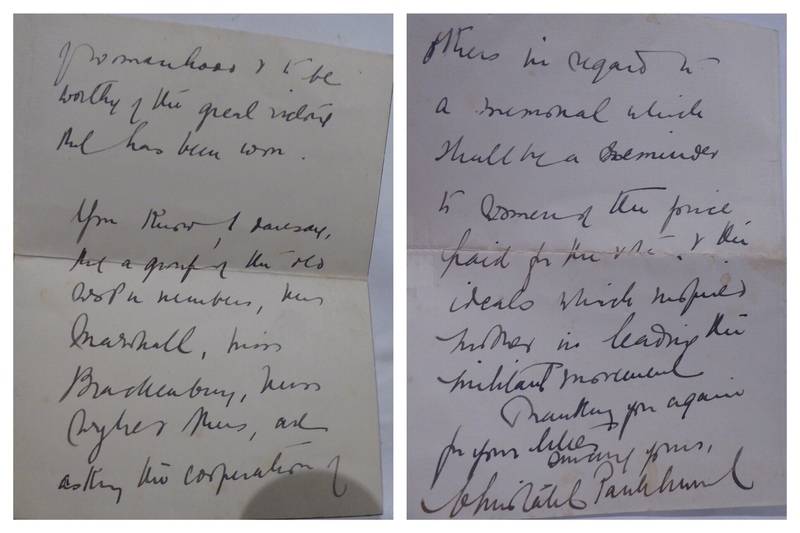 Sarah was mentioned several times in ‘The Suffragette’ for donations, producing food for sale and catering, including for the Annual Branch meeting in 1912 (14). Olive and the rest of the family had moved on by the time the women were able to vote in Parliamentary elections in Lewisham. By 1927 she was living in the Stockwell/Camberwell borders at Dover House on Cormont Road – she registered from there as a teacher and also corresponded with Chrisatbel Pankhurst, following the death of Emmeline in 1928 (see above). Dover House is a large Victorian mansion block on an estate created by a family of Protestants fleeing religious persecution in France in the 17th century centering on Myatt’s Fields. 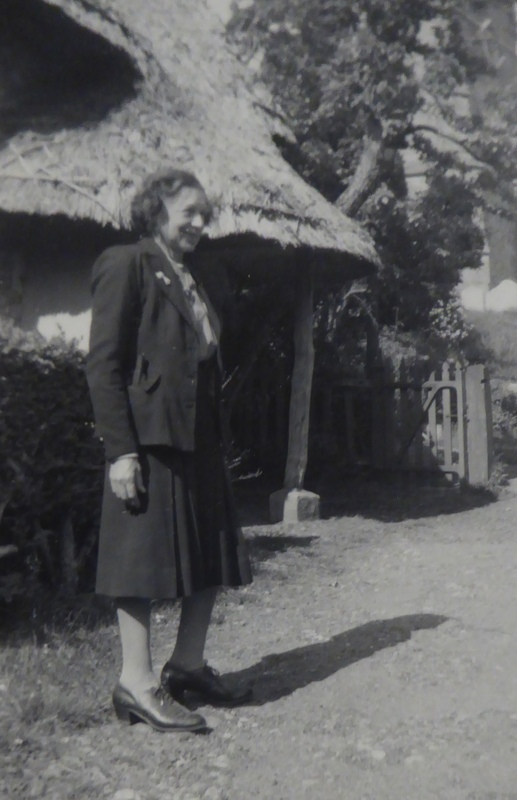 She was living in Poole in Dorset in 1939, she later returned to London –she died in Wandsworth in 1972 – she is photographed below in her later years. 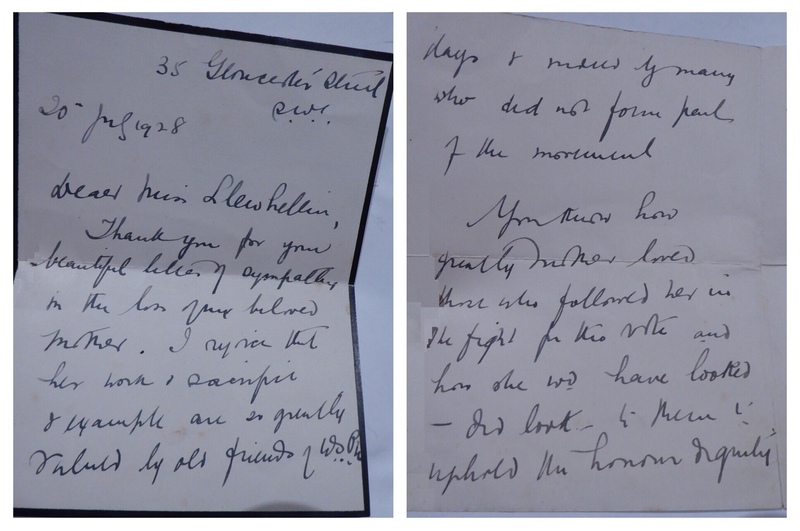 I am indebted to Ruth Knapton for this post; Olive was ‘adopted’ as family by one of her friends; her photographs and some papers relating to her WSPU activity have been passed down within that adopted family to Ruth. The photographs that are used here are done so with Ruth’s permission but remain her copyright. Census and related data comes via Find My Past; the Electoral Register information comes through the always helpful Lewisham Archives. This entry was posted in Lewisham History, Rebels & Radicals and tagged Burnt Ash Hill, Clara Lambert, Lewisham, Lewisham WSPU, Olive Llewhellin, suffragettes, Women's Social and Political Union on February 14, 2019 by Paul B.